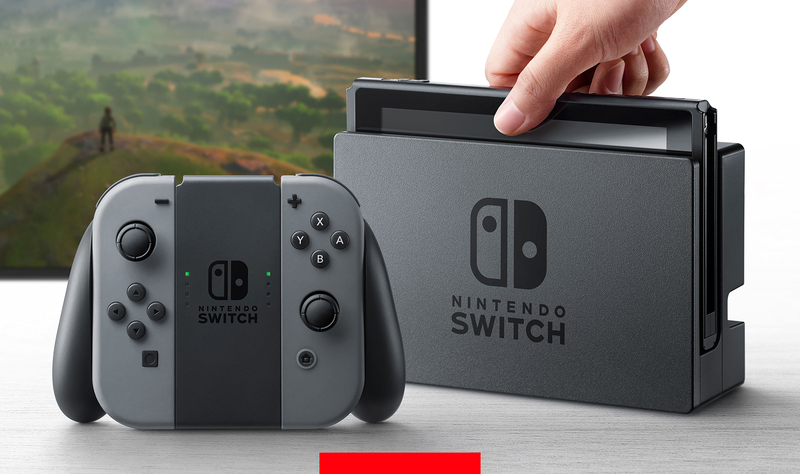 It's been almost a year and a half since Nintendo announced the NX, and now the gaming giant has finally dropped the codename and secrecy in favor of something more official: Switch. Like the countless rumors previously asserted, it's indeed a hybrid mobile and home console with a tablet element and detachable controllers. The tablet itself (which Nintendo calls "the Switch Console") is thin and pretty attractive. It looks to have a screen measuring around 7 inches, of unspecified resolution. At home, it'll plug into the "Switch Dock," which in turn plugs into your TV. While out and about you can either hold it like a Wii U gamepad or use the built-in kickstand to prop it up. In the trailer, a gamer slides what looks to be a 3DS-style cartridge into the tablet, meaning games are likely to distributed both digitally and physically. It's powered by an unspecified custom Nvidia Tegra processor, which is "based on the same architecture as the world's top-performing GeForce gaming graphics cards." Whether that means Pascal -- the architecture underpinning the 1000 series of GeForce cards and the yet-to-be-announced Tegra X2 -- or just that Tegra chips in general are based on the GeForce architecture, is not clear. But the question of which SoC is powering the Switch -- and whether it's based on newer or older architecture -- is important to answer if we're to work out what exactly it's capable of. The controllers are just as we expected. 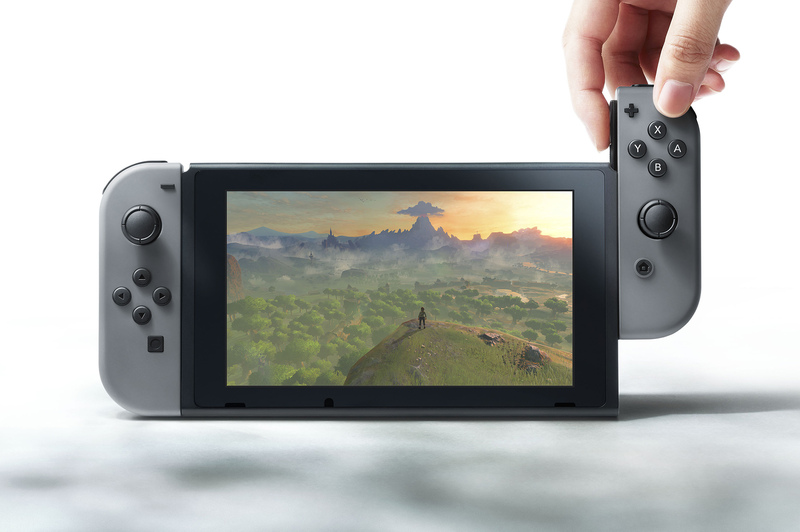 Nintendo is calling them "Joy-Con." They can be attached to a central unit called the "Joy-Con Grip" to behave like a single game controller, but also slide onto the side of the tablet for a more Wii U-like experience. Oh and, as rumored, they can also be used independently like two miniature gamepads. If none of this sounds like your thing, Nintendo will once again offer a "Pro Controller" option laid out more traditionally. The trailer shows off lots of multiplayer gaming, either with multiple controllers connected to one system, or many Switch consoles connecting together wirelessly. We assume it'll have online play as well. So what will you be able to play on it? As well as the usual first-party suspects, Nintendo says it has the support of many developers and publishers, including Activision, Atlus, Bethesda, Capcom, EA, Epic Games, Konami, PlatinumGames, Square Enix, Take-Two and Ubisoft. In the trailer you can see third-party games like The Elder Scrolls V: Skyrim and NBA 2K alongside what look to be a new Mario and Mario Kart games and Splatoon. In Nintendo's bold future, Splatoon will be an e-sport watched live by tens of thousands of people. "Nintendo Switch allows gamers the freedom to play however they like," Nintendo of America President Reggie Fils-Aime said, "it gives game developers new abilities to bring their creative visions to life by opening up the concept of gaming without boundaries." The Switch will be released worldwide in March 2017. Timothy J. Seppala contributed to this report. Aaron writes about design, technology, video games and whatever “culture” is supposed to be. In his spare time he enjoys scouring the world for beautiful furniture, taking long walks on the beach, training orphaned dolphins and making up facts about himself.